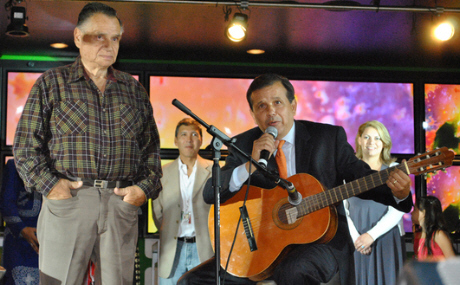 Mayor Miguel Pulido plays the guitar? It isn’t often that we learn something new about our elected officials, but I did learn something about our Mayor here in Santa Ana, Miguel Pulido, when I found a post about how he played the guitar and sang with his father at the recent Fiestas Patrias event. I am not sure what the song was that they sang, but I am told by folks who were there that it was very moving. They performed together during the El Grito portion of the event. The Grito de Dolores (“Cry of Dolores”) was the battle cry of the Mexican War of Independence also known as El Grito de la Independencia (“Cry of Independence”), uttered on September 16, 1810 by Miguel Hidalgo y Costilla, a Roman Catholic priest from the small town of Dolores, near Guanajuato. Hidalgo and several criollos were involved in a planned revolt against the Spanish colonial government, and the plotters were betrayed. Fearing his arrest, Hidalgo commanded his brother Mauricio, as well as Ignacio Allende and Mariano Abasolo to go with a number of other armed men to make the sheriff release the pro-independence inmates there on the night of 15 September. My children: a new dispensation comes to us today. Will you receive it? Will you free yourselves? Will you recover the lands stolen by three hundred years ago from your forefathers by the hated Spaniards? We must act at once… Will you defend your religion and your rights as true patriots? Long live our Lady of Guadalupe! Death to bad government! Death to the gachupines! Hidalgo’s Grito did not condemn the notion of monarchy or criticize the current social order in detail,but his opposition to the events in Spain and the current viceregal government was clearly expressed in his reference to bad government. The Grito also emphasized loyalty to the Catholic religion, a sentiment with which both Creoles and Peninsulares (native Spaniards) could sympathize; however, the strong anti-Spanish cry of “Death to the Gachupines” (Gachupines was a nickname given to Peninsulares) probably had caused horror among Mexico’s elite. The Battle of Guanajuato, the first major engagement of the insurgency, occurred 4 days later. Mexico’s independence would not be effectively declared from Spain in the Declaration of Independence of the Mexican Empire until September 27, 1821, after a decade of war. Hidalgo was eventually betrayed and executed, but the movement he began did result in Mexican independence, a decade later. Mayor Pulido and his father both were born in Mexico. They still have family in the home country. Clearly they have not lost their connection with their homeland. TEACH TODAY FOR TOMORROW – HOME OWNERSHIP MADE POSSIBLE! 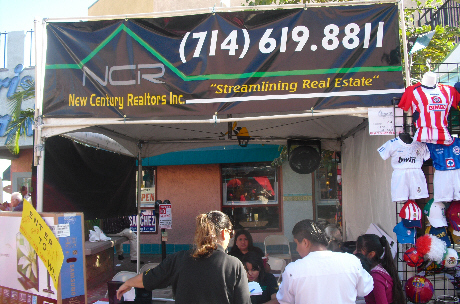 The companies successfully sponsored a booth on September 18 and 19, 2010 in the City of Santa Ana, CA where the Give Back Program at the Fiestas De Independence was enormously successful. Over 4,000 prospective clients spoke to Licensed Loan Officers and Real Estate Agents concerning opportunities for them to sell, purchase, Short Sale, Refinance and Streamline Home Loans. Ela Kitchen our in-house Credit Specialist was able to begin the process of assisting clients with problematic credit ratings and offer workshops in order to teach how they can help themselves. 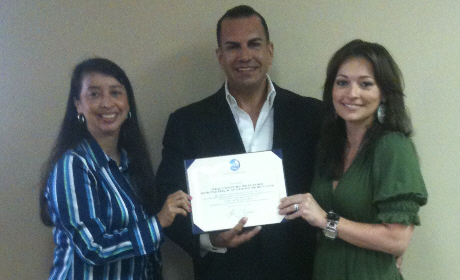 Our plan is to educate, network and empower the Hispanic community with basic financial information to purchase a home. Our Team Members will assess their current financial situation then direct them to the correct specialist (Credit Experts, etc.) to assist them further. Our companies’ belief in the old adage, “Give a man a fish; you have fed him for today. Teach a man to fish; and you have fed him for a lifetime” will translate to more responsible home ownership. The partners’ belief of teaching others who have yet to realize The American Dream of becoming homeowners is critical to their connection with the community. We are proud to work and live in the always improving City of Santa Ana and are thrilled to help create the opportunity for others to call Santa Ana home. For further comment or interviews, please contact Dori Avila, Marketing Director, at 714.619.8811ext. 219 or Andy Molina, Assistant Marketing Director. For over 20 years New Century Realtors and Sur Pacific have built solid relationships and taught their clients how to choose a home they can afford and a home loan program that makes sense so they can acquire the American Dream without defaulting on their mortgage. I stopped by the Fiestas Patrias event in downtown Santa Ana today. Boy was it crowded! Everyone was having a great time. The exhibits are set up all along Fourth Street, or Calle Cuatro. Vendors included a dizzying array of major corporations, such as Wells Fargo, Albertsons and State Farm Insurance, and smaller vendors selling toys, jewelry, hats and clothing. And there were a ton of food vendors too. 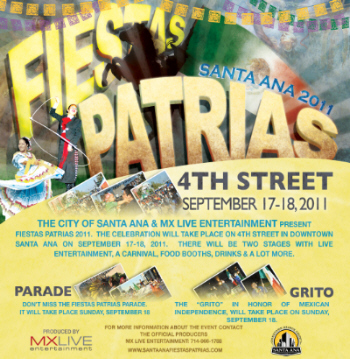 The Fiestas Patrias parade is scheduled for tomorrow, Sunday, Sep. 19, at 4 pm. Disneyland is getting involved this year too, for the very first time. Mickey and Minnie Mouse will be serving as Children’s Grand Marshals. 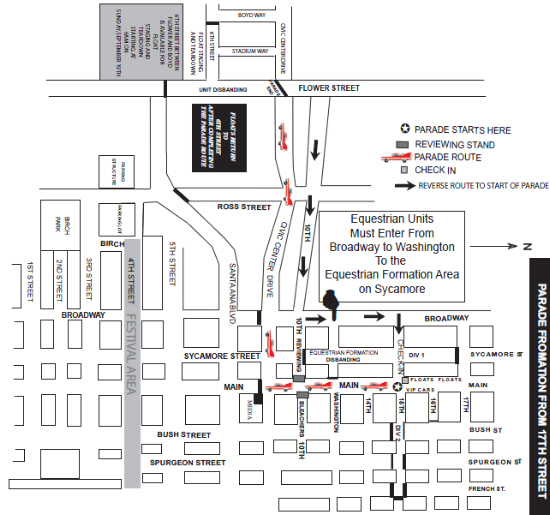 Click here to download the Parade Route map or see the graphic above. 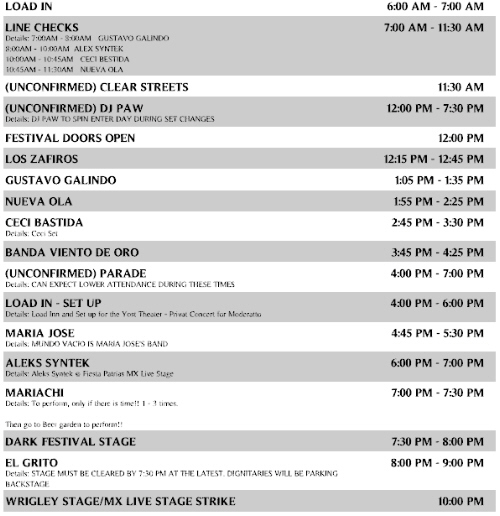 Click here for the full entertainment schedule for today’s and tomorrow’s musical performances, at the Fiestas Patrias event. The Fiestas Patrias Film Festival is also continuing this weekend. Click here to read about it. Click here to see a picture slideshow of last year’s Fiestas Patrias event and parade. The 32nd Annual Fiestas Patrias will return to downtown Santa Ana, Orange County’s largest Mexican Independence street festival, September 18-19 for another fun filled extravaganza featuring some of today’s Top Latin Artists on the main stage including; Aleks Syntek, Maria Jose, Paty Cantu and more to be announced. Each year over 200,000 attend the weekend festivities and this year promises to be special as we celebrate Mexico’s Bicentennial. Santa Ana’s Fiestas Patrias celebration will be filled with food, a carnival and Top Latin Billboard entertainment lined up the entire weekend. For the first time MX Live Entertaiment will be joint producers along with Velasquez Publishing and Promotions of the Festival handling all marketing, PR, talent booking and production. Click here to see Saturday’s entertainment schedule, or see the graphic above. Click here to see Sunday’s entertainment schedule, or see the graphic above. Click here to see the full list of sponsors for this year’s Fiestas Patrias. 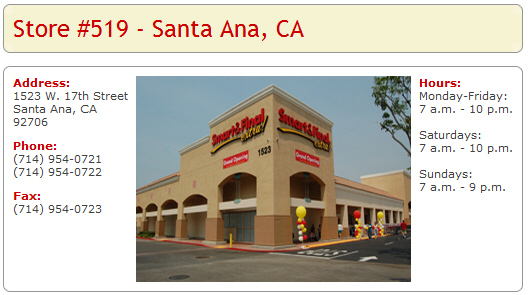 The Smart and Final Extra store located in Santa Ana, at 1523 W. 17th St., is celebrating Fiestas Patrias this Sunday, September 19, from 12 noon to 4 pm. One entry per store will be selected for a $25 gift card. First prize winning entries will compete for the Grand Prize of a New Nintendo Wii (est. value $300). Winners will be notified by Oct. 20, 2010. September 16, 2010 will mark the 200th anniversary of Father Hidalgo’s call (El Grito) for Mexico’s independence from Spain. The Fourth Street Mexican Independence Day Festivities has been a positive community event supported by the downtown businesses and the community for the past 21 years. Given the significance of the Bicentennial a wide variety of activities are planned throughout the year in Santa Ana including an official El Grito ceremony at the Bowers Museum on September 15; a Bicentennial festival including a carnival on Fourth Street in Downtown on September 18 and 19; a symbolic El Grito ceremony and a parade on Sunday, September 19. Other activities will include a series of city-wide Mexican Independence cultural events highlighting the historical significance of the El Grito Bicentennial. 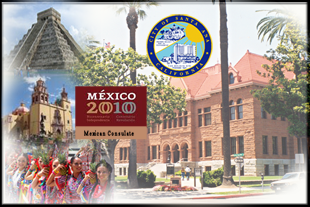 Click here to see all the events that the Mexican consulate is sponsoring. Time 4 p.m. to 6 p.m. 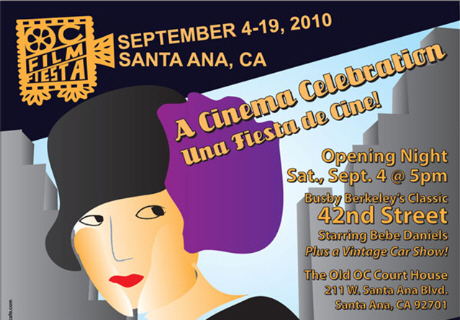 The Santa Ana Film Fiesta is a film festival component of The City of Santa Ana’s 2010 “Fiestas Patrias – Fiestas de Independencia” Mexican Bicentennial events. It’s a celebration of the Santa Ana’s Latino heritage through cinema and an educational tour of Santa Ana’s historic roots. This unity-building event will provide downtown audiences, both new arrivals and traditional families, with entertaining events throughout the City of Santa Ana that deepen relationships with local cultural groups, businesses, colleges and the film industry. Opening night is on Sep. 4, at 5 pm. The festival will continue through Sep. 19. Watch Busby Berkeley’s classic 42nd Street, starring Bebe Daniels, plus a vintage car show, at the Old OC Courthouse, located at 211 W. Santa Ana Blvd., in downtown Santa Ana. Click here for the full Film Fiesta schedule. Every year, over 200,000 visitors attend Santa Ana’s “Fiestas de Independencia” Mexican Independence Day festivities centered along historic 4th Street, “La Calle Cuatro.” This year will feature musical artists Aleks Syntek, Maria Jose, Paty Cantu and Elefante. The Santa Ana Film Fiesta will add a vital new dimension to these traditional festivities by celebrating Santa Ana’s cultural diversity through a selection of feature films, documentaries and shorts. Join us for this year’s new and dynamic Film Fiesta, a cinema celebration in the historic heart of downtown OC! The Santa Ana Film Fiesta will be produced by Sandra Peña Sarmiento (aka “Pocha Peña”), an award-winning filmmaker, artist and writer who has directed film festivals in California and Texas. Sandra is the founder of POCHARTE Gallery, an influential arts space which operated for several years in Santa Ana’s Santora Building. Their plan is to educate, network and empower the Hispanic community with basic financial information to purchase a home. Their Team Members will assess their current financial situation then direct them to the correct specialist to assist them further. This will begin to fulfill the partners’ passion to give valuable information to others who have yet to realize the American Dream of becoming a homeowner. Academy Mortgage Corporation and New Century Realtors are located at 2670 North Main St., which is located at the southwest corner of North Main St. and Memory Lane, just south of the MainPlace Mall, in Santa Ana. “A downtown celebration honoring Mexico’s bicentennial that was initially set to kick off Sept. 11 and sparked a firestorm of protests has been moved to the following weekend. The date change came at the request of the festivities’ promoters, Santa Ana City Manager Dave Ream said Thursday,” according to the O.C. Register. Ream and his administrators were the ones who chose this date in the first place. Alejandra Garcia Williams, who currently serves as the Consul of Mexico in Santa Ana, asked Ream to change the date. Kudos to Garcia Williams for defusing the ridiculous racist protest against this event. Why Ream chose Sept. 11 for this event in the first place is a real mystery. The Minutemen showed up to protest today at the Mexican Consultate’s office in Santa Ana, at 7 a.m. 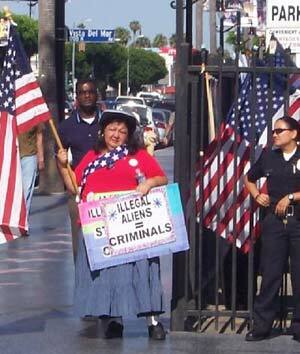 They were led by Lupe Moreno, a Republican activist who lives in Santa Ana. In the video above, Moreno resorted to calling the mother of Naui Huitzilopochtli, the videographer, a “puta,” or whore. He then rightfully wonders what sort of Christian Moreno is. The Minutemen are in an uproar because the City of Santa Ana decided to hold this year’s Fiestas Patrias event on September 11. They are protesting tomorrow, March 31, at the Mexican Consulate in Santa Ana , from 7am to 9am. 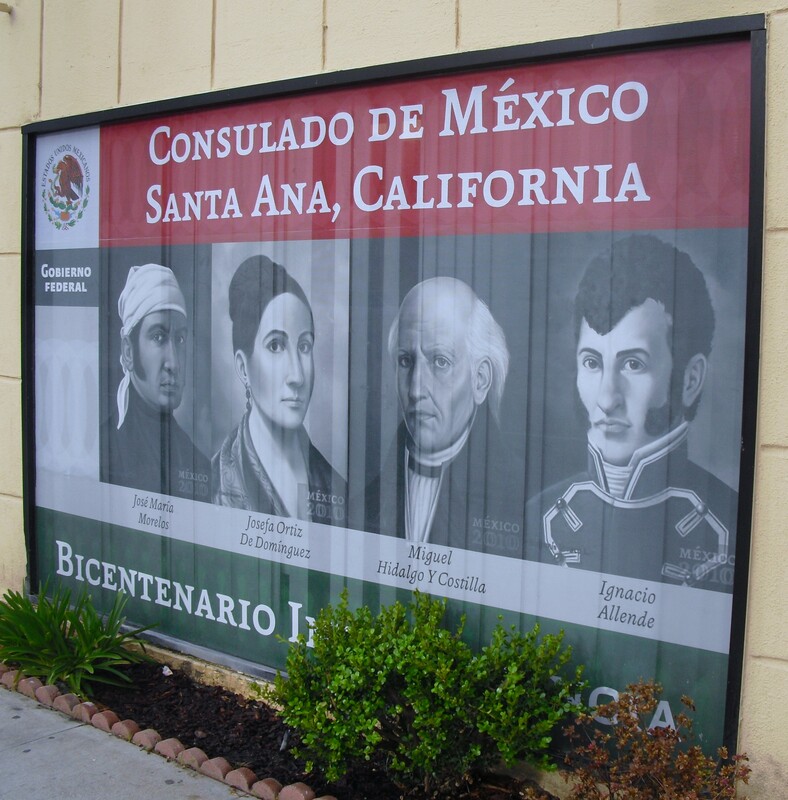 The Consulate is located at 828 North Broadway, in downtown Santa Ana. Counter-protesters will be there as well.